The first time a Huawei P8 Lite phone was heard of was back in 2015 when the Huawei P8 was launched. However, the Chinese OEM has subsequently launched the P8 Lite 2017 as a successor to this phone, packing in some impressive specs and features. Strange enough, the company chose to go for P8 Lite 2017 rather than P9 Lite 2017, which has a lot in common with the just-released P8 Lite variant. The Huawei P8 Lite 2017 is a midrange phone just like its predecessor. However, you will still love what the device brings to the table, especially when talking about the hardware specs as well as battery, which is one of the most important aspects of a modern-day phone. The design features a nice metallic frame and a curved glass on the back and front. Despite its class, the Huawei P8 Lite 2017 packs a speedy fingerprint scanner that helps you reduce dependence on passwords, patterns, and passcodes. Huawei went for a decent 5.2-inch display screen with a resolution of 1920 x 1080 pixels. Like many other Huawei phones, the P8 Lite 2017 comes powered by a HiSilicon Kirin 655 processor that has a Mali T830 MP2 GPU and a RAM of 3GB. In terms of storage, you only get 16GB, but this should be supported by a microSD card of up to 128GB. The rear of the Huawei P8 Lite 2017 has a 12MP snapper that is supported by autofocus and LED flash. As for the front, you get a capable 8MP snapper for selfies and video calls. Being a modern phone, the P8 Lite 2017 supports the latest connectivity standards, among them Bluetooth 4.1 and NFC, meaning you can enjoy Android Pay services on this phone. To keep the phone alive is a huge 3000mAh battery unit, which should be enough to take you past 24 hours on a single charge, especially with the help of advanced doze mode on Android 7.0 Nougat – it comes preinstalled. 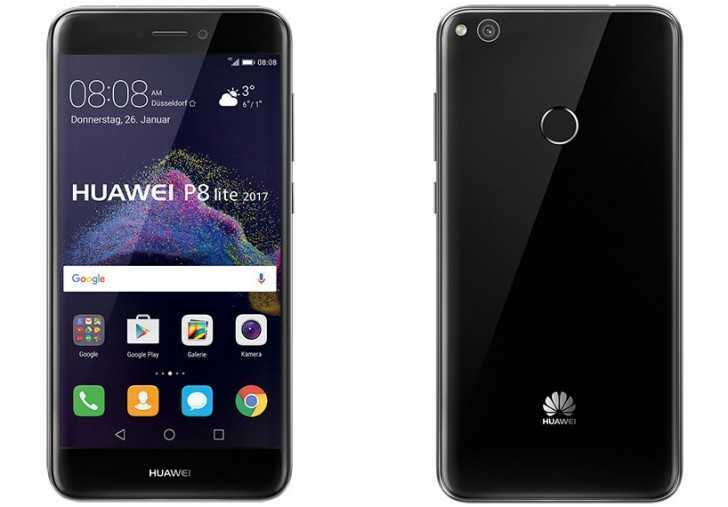 In terms of price, the Huawei P8 Lite 2017 will be yours for 239 euros, with this price affecting the European or rather German market. When compared to the P8 Lite and P9 Lite, this phone is the most expensive at debut.